Ice cream offers joy no like other. Just one scoop can instantly brighten up one’s mood. And what better way to spread the joy of this season than with pints of ice cream? The problem has always been keeping the ice cream frozen while traveling to the party, or making sure the recipient doesn’t end up keeping the ice cream under the Christmas tree for days. So many times has melted, soupy ice cream ruined a celebration. Good thing Karabella made sure that their ice cream, stored in HoliDairy packs, are ever ready for long travels and even longer parties. “We had a customer that bought the ice cream from Papi’s Pinoy Kitchen, a partner restaurant in Makati. 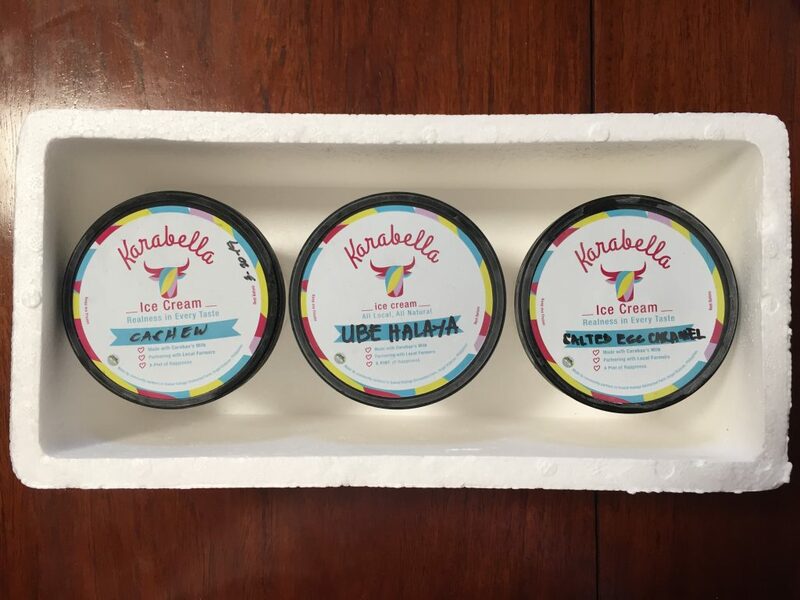 She then told us that she bought a HoliDairy Pack and brought it back all the way to the Quezon province and it took her seven hours of travel time,” shares Erika Valerie Ng Wong, founder of Karabella. The ice cream brand, a social enterprise that helps dairy farmers, has always championed Filipino flavors. The proudly Pinoy range includes ube halaya, salted egg caramel, tablea, leche flan, turon with langka, and peanut butter—all made with 100-percent fresh carabao milk. “We usually look at Filipino delicacies, treats, and innovations; and we try to imagine them in an ice cream. After which, we let some of our loyal customers try it out to get their feedback to further improve the flavors,” explains Ng Wong. A decadent roasted white chocolate cashew is Karabella’s newest flavor, borne out of a partnership with Auro chocolate. “Since Auro’s launch, we have been working closely with them and trying to incorporate their chocolates into our ice cream,” shares Ng Wong. When Auro introduced a 32% bean-to-bar roasted white chocolate cashew, Karabella took it as the perfect opportunity to transform the chocolate into a cool treat. The result is the perfect balance of indulgence and elegance, reminiscent of white Christmas mornings. Both kids and adults will enjoy the flavor as a Noche Buena meal-ender. Karabella plans to release more flavors soon, surely with that distinct Filipino flair. For now, the HoliDairy Christmas Pack (P900) is the perfect opportunity to try out the current flavors (you can choose three) and to share pints of joy to loved ones—even those who live hours away (it comes in a reusable, insulated pack). “Since ice cream makes people happy, we want to share the happiness with everyone through our products,” says Ng Wong. Visit www.karabelladairy.com or contact 0917-8613405 and karabelladairy@gmail.com to order. Is gelato better than ice cream?